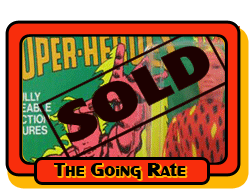 Welcome to the latest project of the Mego Museum, the going rate, a searchable database that allows us to see what something went for and when. Our hope is that this database proves valuable to collectors over the years. 2) Only Going Rate Folks may post, want to join the team? Drop me a PM and I'll hook you up, it's not an exclusive club by any means. We want people to contribute their time here, so if you're willing, you're in. For now, we're going to focus on mint loose examples and boxed or carded. Exceptions made for extremely rare items. We do not need any editorial other than that. We have (for now) chosen to keep Mego lines in individual threads. The exception currently is WGSH due to the long history with the characters. Right now we are archiving mint, loose complete (NO REPROS!) and carded/boxed examples. In extreme cases (like alter egos or Tomland rarities) we will archive partial figures. Megolike auction results are welcome. When starting a thread (IE Tarzan) PLEASE check to make sure there isn't already one. Questions? We'll start a thread in Auction Watch to answer any and all of those.